You have a new update. With it, I bring no new features. I know you may have been hoping that I'd surprise you, this April 2nd, with something, anything...but alas, the only thing I'm bringing to this party today is duct tape, scissors and petroleum jelly. I'm here to address the recent interruption issues that some (not all) Xbox Live users may (or may not) have experienced when playing a limited (again not all) Xbox 360 games. 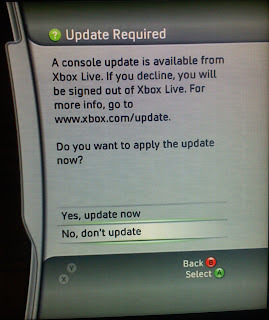 In the future when I do have some new features, you will be the first to know, because I love you, my dear Xbox 360 user 12337892, and no one else.